What If I Don’t Wake Up Tomorrow? One of my favourite blogger friends, Tomi wrote a piece on depression a few weeks ago and it is something that I can relate to because for the most part of my life, I have been depressed. I have never really been able to allow myself to truly be happy and its something that has really bothered me. For about two days this week, I locked myself up in my room and cried and cried because I found myself in that unhappy place again. I wondered what was wrong with me and suddenly something struck. What if I wasn’t meant to live long on earth? Boom! It seemed like the perfect explanation as to my constant unhappiness. I mean, I have always felt really drawn to Marilyn Monroe and Lisa ‘Left Eye’ Lopes – both women, died at an early age – for so long without really understanding why. I delight in making others happy and not myself and I had been having re-ocurring crazy dreams that made me afraid of sleeping at night. I, mean it felt like the perfect explanation and it freaked the helllllll out of me. Do you know how it feels to come to that sort of realisation? Do you now understand that I had reached rock-bottom? I emailed my pastor about how I was feeling and he prayed for me and encouraged me. I did feel better. However, in that state of despair, I realised one thing. The truth is, I want to live for as long as possible. I want to go through every phase of life. I want to work, get married, have kids, go through menopause, have saggy breasts, watch my children get married, be a fabulous grandma and finally when its my time, hopefully, I get to leave the world in peace and go be with my Father. I also hope to have left a legacy behind. I want all of this for my life. However, I spend too much time worrying about the future…Way too much. 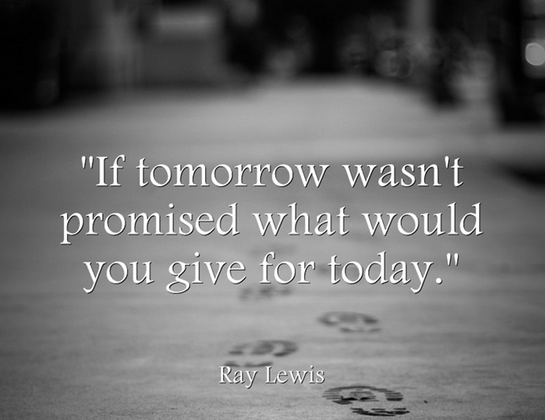 Understanding that tomorrow is not promised for anyone, including myself is really life-changing. I know now that I have to live everyday like its my very last. I have to be nice to people, not hold on to grudges, see the world, play in the sun, dance in the rain and see everyday as a gift from God. It’s easier said than done to be honest because we are humans and as humans, we forget. It’s okay to forget. God never created us to be perfect. However, when we do remember that to wake up everyday is a miracle, let us get down on our knees and say the words ‘Thank you’. Go on to live that day as if tomorrow will not exist for you.